The modern, air-conditioned Girona 108 apartment comes with free Wi-Fi and a private balcony. 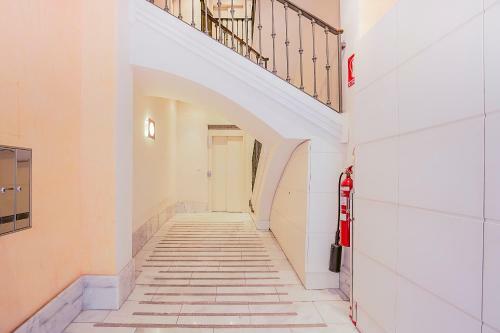 Located 300 metres from Girona Metro Station, it is 15 minutes’ walk from Barcelona’s Plaza Catalunya Square. Featuring a simple, modern décor, the bright apartment includes a living-dining area with a flat-screen TV and sofa bed. The kitchen is equipped with a microwave, oven, dishwasher and washer-dryer. A wide range of restaurants, shops and bars can be found in the streets surrounding Girona 108. Passeig de Gracia Boulevard is just 500 metres away and offers many designer fashion shops. Girona Metro Station connects directly with Barcelona Beach and the Gothic Quarter. Airport trains leave from Passeig de Gracia Station. Please let Girona 108 know your expected arrival time in advance. You can use the Special Requests box when booking or contact the property. Please note that as € 200 damages deposit is required upon arrival and will be refunded upon check-out as long as the apartment is in good conditions and there have been no complaints from neighbours. Keys should be collected directly at the apartment. Bed linen, towels and cleaning upon departure are included. Any extra cleaning is upon request and subject to an extra cost. The modern, air-conditioned apartment comes with free Wi-Fi and a private balcony. Featuring a simple, modern décor, it includes a living-dining area with a flat-screen TV and sofa bed. The kitchen is equipped with a microwave, oven, dishwasher and washer-dryer. There is 1 double room, 1 twin and 1 room with roll-away beds, as well as 2 bathrooms. Rate: € 190.00 ... € 355.00; select dates below to get current rates.